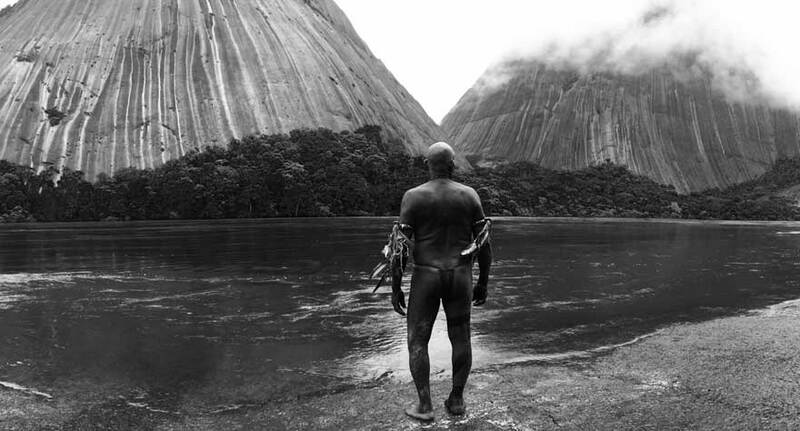 It almost feels like a religious experience, watching a movie that’s as beautifully alien and removed from convention as Embrace of the Serpent. Colombian filmmaker Ciro Guerra‘s Amazon-set drama is an indignant lament on the devastating, festering effects of colonialism, but it’s more experiential and less studious than that sounds. The black-and-white river imagery is supple, hypnotic and frightening, in that startling way that most unfamiliar things are, at first, frightening. The scariest thing, though, is how vividly Guerra shows us—via two white men’s parallel river quests, separated by 40 years—the extent of the destruction pale-skinned conquerors wreaked on the indigenous cultures of the region. Even scarier: the realization that the eradication of our indigenous people, in our America, makes Guerra’s dark fable hit uncomfortably close to home. Like the narrative (which is based on a pair of white explorer’s real-life journals), the production’s heroes are dual, with cinematographer David Gallego having as much influence on the film’s success as Guerra. With locations as lush as the ones we glide and trudge through on the winding South American riverways, it seems best, for a story this restrained and contemplative, for us to simply, respectfully bear witness to the indescribably beautiful surroundings. There’s no need to breathe life into what’s already teeming with overly stylized presentation, and thankfully, Gallego’s got taste. The choice to go monochrome supports the thrust of the story; what would have been about color and vibrancy is now all about light, darkness and shadow. At the center of the first story is Theodor Koch-Grunberg (Jan Bijvoet), a German explorer in search of a rare, sacred flower called the “yakuna.” Theo’s fallen ill on his expedition, tended to by his local guide, Manduca (Miguel Dionisio Ramos). As they land their boat onto the riverbank, they’re met by Karamakate (Nilbio Torres), a shaman who doesn’t take kindly to white men, whose violent conquest has rendered him a companionless river dweller, the last of his tribe. Locals like Manduca, who cooperate with the whites and have adopted many of their Western customs are, to him, just as disgusting. Reluctantly, Karamakate agrees to be their guide (only he knows how to reach the yakuna), enticed by Theo’s promise to help him find the last remaining survivors of his tribe, who the German claims he’s seen with his own eyes. On their journey, the cultural divide is slowly bridged: Karamakate keeps Theo’s illness at bay with herbal medicine; Theo shares some of the worldly belongings he’s hauling around in his clunky luggage box. (Meanwhile, Manduca straddles the cultural line.) Their bond is shaken to the core when they come across a grove of drained rubber trees and indigenous workers mutilated and enslaved by the invaders. Tensions are heightened again when they happen upon a Catholic mission where a mad Spanish priest rules over orphaned indigenous children, forcing them to abandon their old customs as he abuses them on a whim in a multitude of sickening ways. This portion of the film is almost unbearably awful to watch. It speaks to Guerra’s integrity, though, that he shows no measure of restraint in depicting something so horrible as cultural extermination. Again, the true horror is how easily linked the priest’s child abuse is to issues of our time (Spotlight comes to mind). As grim and yucky as this all sounds, the movie isn’t without a few moments of mirth. Evans blowing Karamakate’s goddamn mind with a phonograph under a starry night sky is heart-meltingly cute, and when young Karamakate and Theo exchange the occasional glance of recognition and acceptance at each other, it gives the story just the right amount of hopefulness it needs to avoid being completely depressing. What’ll be most challenging about the film for many is its pace, which is relatively lax and often stretches moments and shots longer than normal. Some would call this meandering; I’d call it glamorously introspective (I have no qualms about staring at Gallego’s images for an extra beat or two—or three). Guerra’s made a magical film in that it feels strangely organic and of the earth. The mechanisms we’re used to recognizing and latching on to—performances, camera moves, editing, sound design—flow together so naturally in Guerra and his team’s hands that Embrace of the Serpent feels of the earth, not of 35mm celluloid.